Yeah, but: I can just see it screwed to one of the bare studs in a garage. The Long Version: Starfrit is a Canadian company that's making its way into the American market, one infomercial at a time. They're the bilingual force behind battery-powered potato peelers, push-choppers, and folding cutting boards. If it has "as seen on TV" on it, there's a good chance that you'll find in on their website. It's not guaranteed, of course, and I can't find the can crusher at all. Rather anticlimactic after this big introduction. 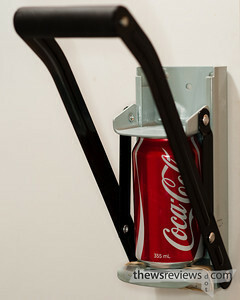 The can crusher is designed to flatten beverage cans, and does so admirably. 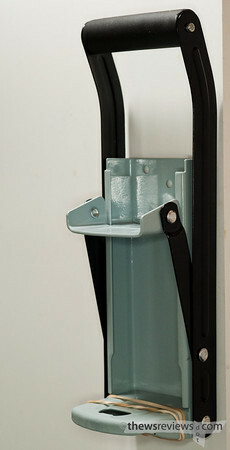 Its construction is solid, with a soft foam handle topping a lever that delivers plenty of power. I'm a little tentative applying force to mine, since it's attached to a cupboard door with double-sided tape instead of (the included) screws. But even with that hesitation, it does the job. My only addition has been a couple of rubber bands that I've wrapped around the base to hold the cans in place as they await their fate. Traction, you know. There is a question about why anyone would want this particular job done. Without reenacting the Frantics' 'Worshipers R Us' scene (again), it's something to have just because it's there. 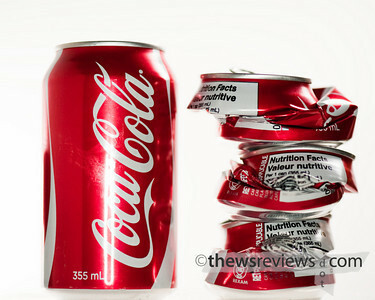 It's fun to use, and the crushed cans do take up less space in the recycling bin. Crushing them by hand isn't as effective or as entertaining. It even includes a built-in bottle opener, just in case there are ever any bottles that don't have screw-tops. I wouldn't recommend running them through the crusher when you're done, though.